Conserve our natural resources for present and future generations by using green energy, minimizing our carbon footprint, protecting our land and its inhabitants as invaluable, promoting plant based diets, and limiting our waste. 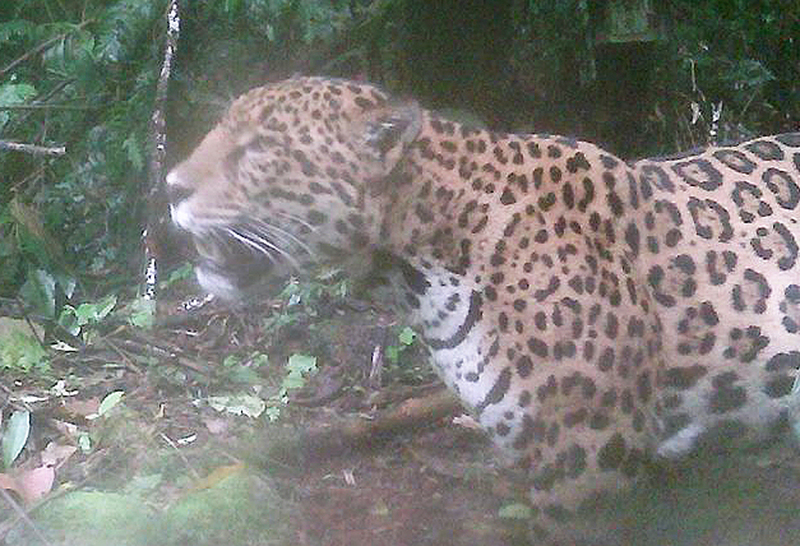 In 2016 and 2017, this Jaguar (Panthera onca) was spotted on our camera traps. Rio Chirripo headwaters rushing with clean water during the rainy season. In view of the rapidly changing global climate, Cloudbridge has embarked upon a Leadership program to encourage lifestyle changes that can reduce this serious threat. Cloudbridge is creating positive change through actions and education in the community and abroad. Three of our staff - Frank Spooner, Tom Gode, and Linda Moskalyk - have attended the Climate Reality Leadership training sessions led by Al Gore, as part of the Climate Reality Project. 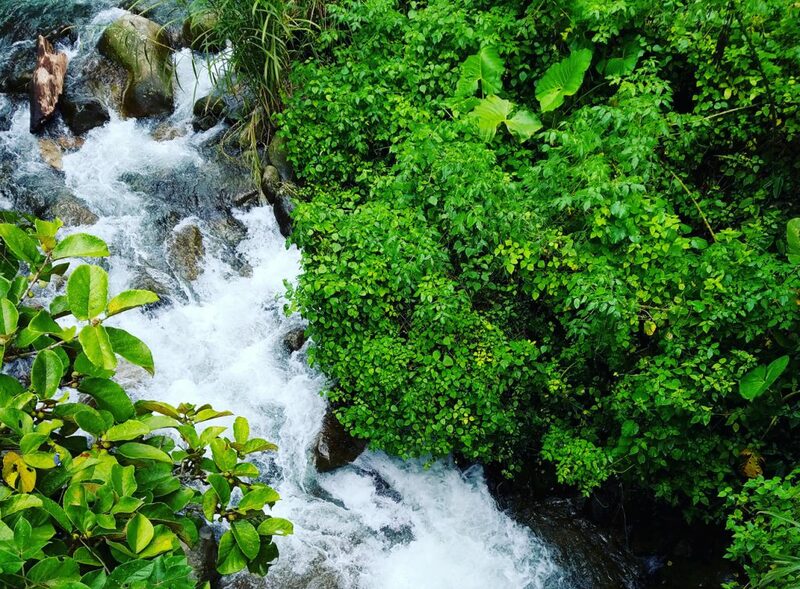 Cloudbridge is committed to conserving its property as an invaluable tropical ecosystem for future generations. In a decade and a half, we have planted over 50,000 native trees and reestablished tree cover on most of the reserve’s 700 hectares (1,540 acres). While we continue to reforest areas, we are also focused on conserving our small amount of old growth forest (area that has not been harvested since the turn of the 20th century) and also protecting those areas that have seen great strides in growth since 2002. Biodiversity booms with dozens of species thriving in this single frame. Cloudbridge feels it is important to use and promote green energy, and most of the reserve’s electricity needs are currently being met through green energy. Upgrading our solar energy system in 2011, we installed a micro-hydro electricity system. This system uses gravity to transport water down a narrow tube and through a turbine to produce electricity. Excess energy is stored in a series of battery packs. The energy generated from this unit provides electricity to all the buildings in the main part of the reserve, while our remote Gavilan Cabin is equipped with solar panels. In an effort to reduce waste at Cloudbridge, food scraps are composted and used to enhance the soil when planting our seedlings. Cloudbridge staff and volunteers also assist in the recycling program in our local town of San Gerardo de Rivas by sorting and crushing cans and bottles in preparation for pickup. 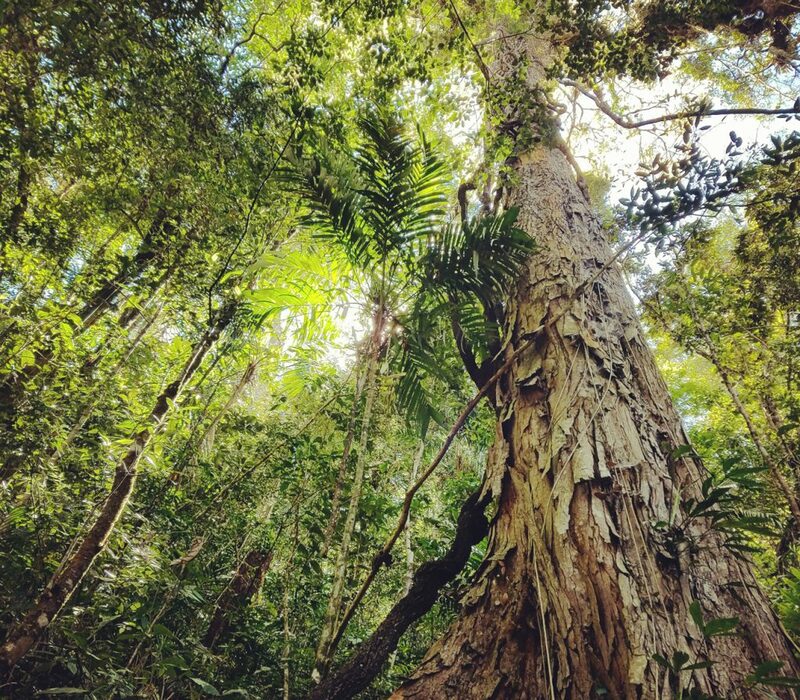 Cloudbridge’s reforestation efforts have helped to restore and preserve the native forest to protect the biodiversity for which neotropical forests, and those in Costa Rica in particular, are so famous. Deforestation is causing the loss of about 100 species every day — 4 species per hour. Preserving forest and planting trees also helps offset air pollution. As they grow, trees absorb carbon dioxide from the air. This project is but a tiny step to counteract global climate change, but every tree matters. 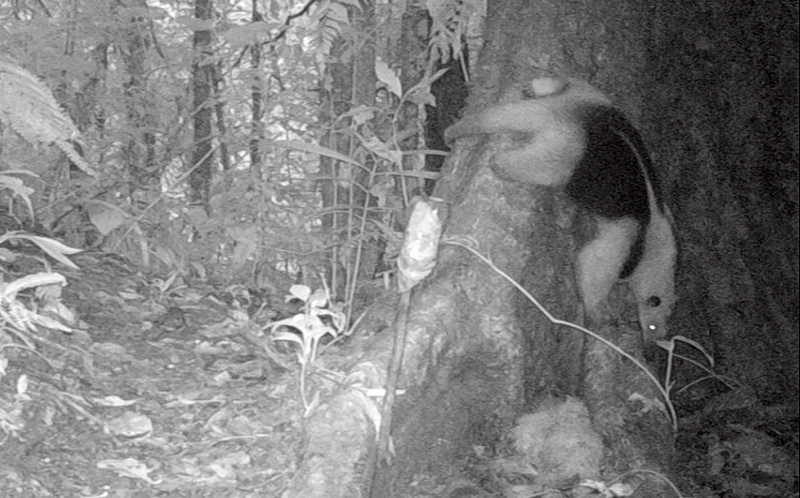 This agile Northern Tamandua (Tamandua mexicana) is a type of anteater. Recently our efforts have afforded us a few successes! As of October 2016, images from our camera traps have shown that all six of Costa Rica’s cat species have returned to the reserve. These include: Ocelot (Leopardus pardalis), Oncilla (Leopardus tigrinus), Margay (Leopardus wiedii), Jaguar (Panthera onca) (see photo at top of page), Puma (Puma concolor), and Jaguarondi (Puma yagouaroundi). Additionally, the endangered Baird’s Tapir (Tapirus bairdii) (the largest mammal in Central America) and the endangered Black-handed Spider Monkey (Ateles geoffroyi) can both be found inside Cloudbridge’s borders. Please see our species list page for complete lists of the flora and fauna identified in the reserve. Hunting on our property is strictly prohibited. The Baird’s Tapir (Tapirus bairdii) is a sensitive or endangered species residing here. A plant-based diet is encouraged at our reserve as it is an important factor in combating climate change. 15% of all greenhouse gas emissions are produced from the livestock sector in agriculture. This is almost equivalent to the amount emitted from all cars, trucks and other automobiles combined. Eating meat has been a part of cultural practices and traditions and as the middle class increases worldwide, more and more people are including meat in their diet on a daily basis. This is one of the major causes of deforestation of tropical forests as more land is needed to raise animals, especially beef. Food production also relies on other environmental resources. Both the water and land required for a calorie of meat is far greater than the amount required for plant-based foods. It is estimated that the greenhouse gas emissions of a vegetarian diet are half that of a meat based diet. A good reason to think about eating less meat. We invite everyone to contribute in some positive way to tackle climate change. Learn more through our site, read the links below, support organizations you believe in, and visit us to see how to make changes in your life! Leading by example, you can help show a way to a sustainable future for all who live on this planet. We believe that small actions do make a difference, and if enough people step up and take action, we will succeed in saving our home, Planet Earth. Please consider giving support with monetary donations, fundraising at home, encouraging a virtual tour with your local schools, and/or volunteering at Cloudbridge.